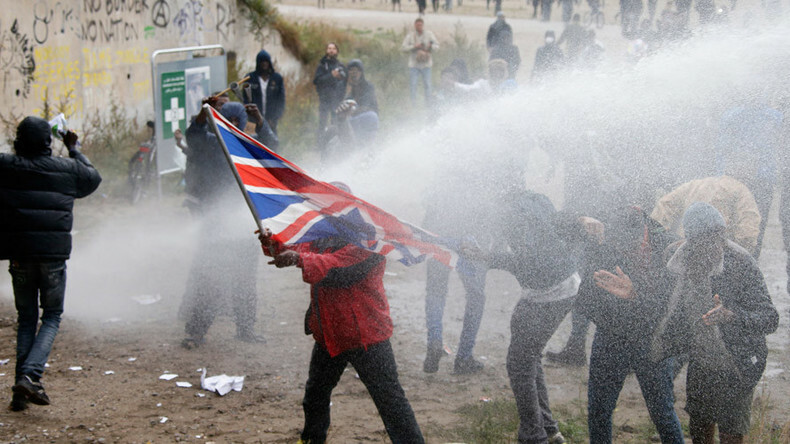 French police try to disperse a pro-migrant demonstration in Calais with a water cannon and tear gas, a Ruptly live feed showed. The protest has been called despite a ban introduced by the mayor on any gatherings concerning migrants. Dozens of people were seen marching along a road in the northern French city, carrying banners, chanting slogans, dancing, and playing musical instruments, according to footage from Ruptly video agency. About 200 asylum-seekers and 50 activists clashed with police who used tear gas and water cannons to disperse the crowd, Reuters reported. Protesters who gathered under a bridge next to the ‘Jungle’ threw stones at security forces, in opposition to the dire conditions of the makeshift camp. Another 150 protesters in four buses who left Paris on Saturday were blocked by police on a road some 30 miles (48 km) short of Calais. 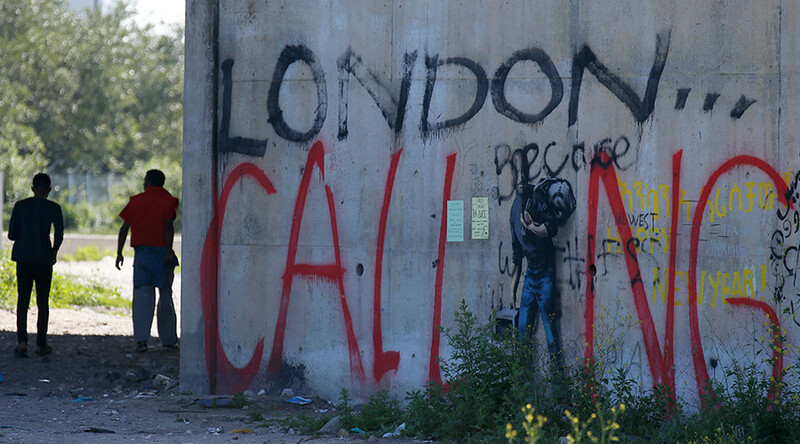 The rally took place Saturday at Calais’ notorious ‘Jungle’ refugee camp to express their solidarity with asylum-seekers following a call from the International Coalition of Sans-Papiers Migrants and Refugees (CISPM). The demonstration was planned to start at the Jungle camp before proceeding to the city center. Several protesters may have been injured during the demonstration, according to a tweet of a reporter at the site. One of them had his arm broken. Police are yet to confirm this. Three police officers were slightly injured during the clashes, Europe1 reported. The ban on all public gatherings concerning the migrant issue was imposed the day before, September 30, by Calais Prefect Fabienne Buccio amid fears of violence. The ban is a short-term decree that will probably be lifted soon. However, anyone who stages a rally, anti- or pro-migrant, while it is in force, is to be charged with an offense. “[An earlier] protest organized by CISPM and the Parisian pro-migrant charity Solidaires Migrants in January triggered a sudden escalation of violence and presented a grave threat to public order both in town and at the port of Calais,” the prefect said in a press-release, explaining her decision, according to the British Express newspaper. The ban was supposed to help local police since they are busy maintaining order along the port of Calais ring road and have no extra staff to look after the rally as well, Buccio added. Migrants vs CRS à #Calais. In September, the main highway leading to Calais was blocked by truck drivers and farmers who demanded that the Jungle camp be closed. Cross-channel commuters were said to have faced disruption, though the Port of Calais reported ferries were not affected by the protest and operated without interruption. Hundreds of protesters gathered back then on the road located close to the Channel Tunnel and ferry terminals. 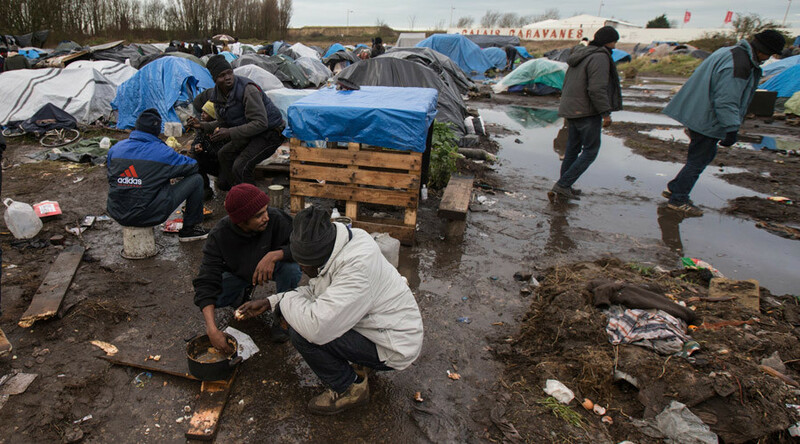 Claude Rochet, a professor of public policy from Versailles Saint-Quentin-en-Yvelines University (UVSQ), believes that the resettlement of refugees from Calais is “not a good idea.” Most of the refugees, currently living in Calais, want to head for Britain and are “not interested” in being relocated to a small town in France. “It is not of any help to force the process,” the professor told RT. Meanwhile, UNICEF has called on the British government to speed up the resettlement of an estimated 400 unaccompanied children from the camp. The charity is concerned that the children might disappear after the Jungle is dismantled.